Now this is very cool. Three brothers and Corvette enthusiasts scooped up a messy old 1957 Corvette race car and have brought back from the rough. It all starts out like many car stories - at a bar talking cars - where Kevin Hussey was shooting the breeze with a friend and the topic of Vette restoration came up. The friend asked Kevin how much it would cost to fully restore an old Vette he owned. After viewing the car, Hussey answered honestly with a high number, but if the friend ever wanted to get rid of it, Kevin would be interested. Fatal last words. Eventually the exchange took place, but the pedigree of the Vette didn't come to light until after the car had changed hands. After a little research, Kevin began to suspect the car was equipped with the ultra-rare RPO 684 and RPO 579E "airbox" options packages. After a bit more work, and a trip to see some Corvette experts, it was determined that the car they had was indeed a diamond in the rough and very rare. A full restoration was called for, but not one which would bring it to concourse standards. Nope, the maverick brothers decided to rebuild the car in the image of a vintage racer. 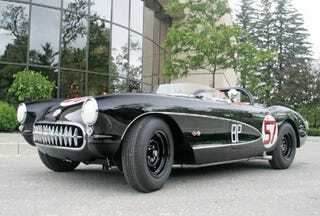 Very cool story and definitely worth a read over at Vette - more pics too.